ShoutWiki offers a set of social tools for your wiki. These tools add social, forum-like features into your wiki, such as avatars, social user profiles, per-user discussion boards, friending and foeing. These tools are not enabled by default, but you can ask the Customer Support Team to turn them on for your wiki by contacting us, either through Special:Contact or by emailing troppus moc.ikiwtuohs. 2 How do I use these tools? 3 The social tools aren't available in my language. Help! Social tools can attract a lot of new users to your wiki and they can make wiki-editing a bit easier for newbies, as many people have at least some kind of previous experience with discussion forums. How do I use these tools? 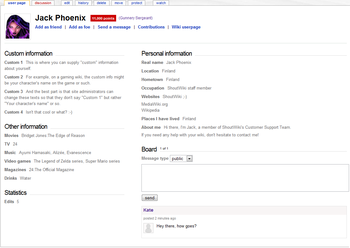 An example of a social userpage, complete with user discussion board and information about the user. Using the social tools is easy and fun! By going into your userpage, you'll see what the new social profiles look like. The profile page has a lot of links that will get you started with the social tools in no time! Clicking on Upload Avatar takes you the special page Special:UploadAvatar, where you can upload your own avatar (a small photo representing yourself). Edit Profile link takes you to Special:UpdateProfile, a special page where you can update your publically displayed info, such as your location, interests, hobbies etc. Wiki userpage takes you to your "normal" userpage, usually prefixed with UserWiki: instead of User:, as your social userpage is prefixed with User:. That is, if your username is John Smith, your social userpage would be at User:John Smith and your normally editable userpage would be at UserWiki:John Smith. Clicking on Use wiki userpage (or alternatively, Use social userpage) switches the type of your userpage between the social and normal one. When other users view your social userpage, they can choose to become your friend or foe, send you a message, view your contributions and normal wiki userpage. By clicking the Send a message link, you can send a discussion board message to the user. This differs quite a lot from talk page messages. With the discussion board, you can select the message type from the two options: public or private. Public discussion board messages will display on the user's social profile to everyone, while private ones can only be viewed by the user whom the message was sent to. Your user level and your points are displayed on your userpage to everyone, if the feature is enabled on the wiki. The list of top users (users with the most points) can be viewed at Special:TopUsers. The social tools aren't available in my language. Help! Please see Help:Translations for info about how you're able to translate the social tools into your language. If you notice a user abusing the social tools, please contact a local administrator first. You can view the list of the wiki's administrators at Special:ListUsers/sysop. If you are an administrator on a wiki where social tools have been abused and you are unsure how to deal with it, please contact ShoutWiki's Customer Support Team. This page was last edited on 12 March 2019, at 16:27.